Eager to make something out of the new fabric, I tried out My Spare Time's free pleated purse pattern. I made the straps a little bit longer so I could wear a coat and still fit the bag over my shoulder. And since this is made of nice, sturdy canvas, I skipped putting in interfacing. This tutorial for inserting magnet snaps was helpful, too. I love that pattern...very hip. Great bag - the fabric makes it! Great job, and soooo cute! Misery loves company - I'm feeling better knowing someone else's seam ripper gets a workout when taking on a new project. Love the bag! I should probably buy a seam ripper one of these days. I lost mine and have been using my embroidery scissors for a couple of years now, haha. I love her pattern, and since she posted it I've been looking for some great fabric to make it with. Yours turned out so great! Oh I just found your blog from creature comforts. 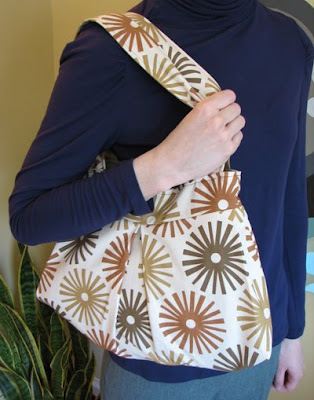 I love the fabrics you got and that bag you made is great! Where can I get one? Oh, goody , you have an Etsy shop. Devine! :) Have a beautiful day! Love the bag. Fabrics + shape of the bag are a perfect combo. It looks great, and I love your new fabric! I'm so impressed that you've had all your great designs printed on fabric! I'm just finishing my first bag and I'm way too lazy to rip out all my mistakes!!! This bag is adorable, thanks for posting the link. Once I regain some confidence I'm going to make this bag. I HATE RIPPING OUT SEAMS. really cute bag, and thanks for the link! Awesome...it's great with a longer handle...and glad to hear you used your seam ripper. It turned out beautifully. I think it looks great. You did a fabulous job! I'm such a huge fan of this blog, it is so cool to see my bag design on here! Yours turned out so great!! Very cute! I love it!! Great fabric, really makes the bag cute! I absolutely love your blog! And this purse is amazing! That's totally cute! I am best pals with my seam ripper too! Very stylish! :) Smart idea to lengthen the strap for wearing with a coat. Well, and if you don't altogether *forget* the trauma, at least you say to yourself that it was worth it! :0) Great job. I almost bought some of that fabric the other day. Then I remembered I don't sew. Hah! Bag looks great! I love how it turned out thanks for the tutorial link and i am off to order some of your fabric!! Love this--the style and fabric are great together. You've inspired me to break out my sewing machine soon! Nice job!!!! You are quite the seamstress! I'm definitely going to try this. Yours is beautiful! That's gorgeous-- I wish I was half that craftsy! LOL. Great job! You sound just like me in regards to sewing. I know how to put together things in my head but once I get to the sewing machine it all goes downhill from there. 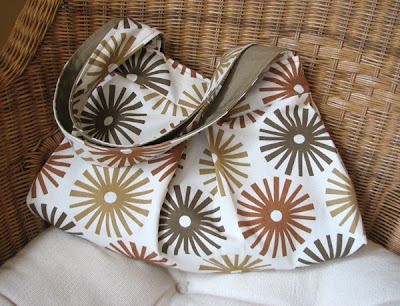 Love the fabric and bag pattern together! Fab job! Oh I'm totally in love. I love the new fabrics too. did you really make that bag all by yourself?? I did. I know, it's shocking to me, too. Mandylifeboats, you crack me up. I can totally relate. I love it :) now it's time to try the buttercup bag! Ha. My seam ripper got a good workout too, mainly because I am not good with straps. But it came out lovely in the end!! Do you think Grandma G will make one for me?